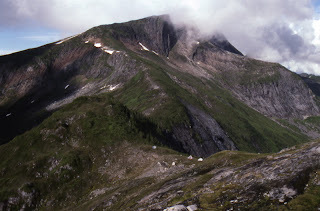 This is one of our camps, you can see our tents in the saddle. All of the work was helicopter based, we'd put in for a week or two at a time. Pretty amazing for sure. I must admit my mode of field transport has been all down hill since then. 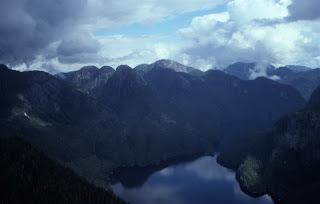 I have no idea what the name of this lake is. These two might explain why I ended up buying and reading and recommending A Beast the Color of Winter (see sidebar). We did most of our hiking on goat trails, and would see them all over the place. They are really amazing animals. I'll never claim to be a mountaineer, but these things, even the babies, make us all look like cows. 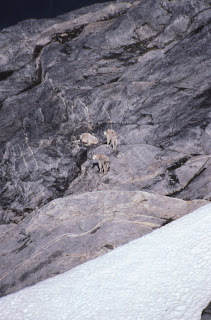 I am pretty sure that acrophobia has been selected against in mountain goats. 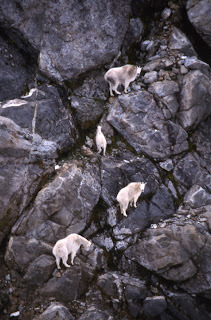 When it comes to climbing up cliff faces your average goat can make a human being look quite pathetic ! A very underrated animal, indeed. I am still amazed that ou don't find more dead ones at the bottom of cliffs. Even the little ones are just absurd in their sure footedness.